No two jobs are the same, requiring flexibility in how we determine your final cost of photography. Commercial photography assignments are as varied as the creativity and needs of our client’s businesses. Your project may be broad, complex and time intensive or it may be a one day proposition of associate head shots. Whatever your commercial photography project, these considerations may be part of your final cost. Prior to your project, we work with a primary contact in your company to gather information and details specific to the photo shoot. We will research your project and market, propose a shot list, time frame, delivery schedule and follow up. This deep discovery process ensures that we understand your vision to create a complete compliment of images you need to feed social media, blogs, website and marketing materials. Did you know? 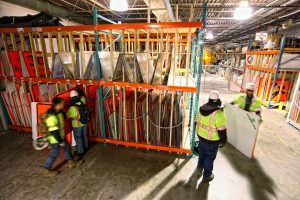 MidAtlantic Photographic carries appropriate levels of commercial auto liability insurance and general liability to meet nearly any job site requirement and will provide documentation as requested. Your project may be completed in one or several days, or you may wish to have an ongoing, regular schedule of photography to document progress, change orders, mitigation or statue of repose requirements. Post production of digital files involves formatting the files to industry acceptable standards for high resolution format, color balance, general corrections and retouching. 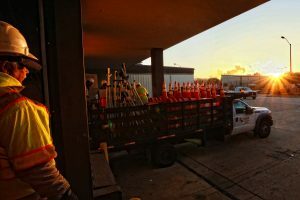 While some level of post production is required of every single image file, images requiring more extensive retouching to address circumstances encountered during the shoot, such as electrical wires, poles, cars and people, etc. may require a post production fee. This will be presented as part of your estimate prior to shooting. Post Production cost is based on the project and begins at $400-600. Some projects are best completed with a Post Project meeting to review your collection of images and to help determine retouching and adjustments to a wide edit of your photography. Some photo shoots require no follow up other than delivery of the images. Post project consultation is included in all projects unless significant travel is required. If travel fees are required to provide our service, fees are based on Federal Per Diem reimbursement for mileage, meals and lodging. 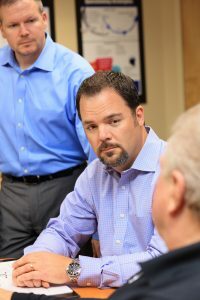 Corporate Head shots can be created at your location or at our location in Bel Air. Your final cost will be determined by the number of subjects to be photographed and the nature of the photo shoot. All images are fully retouched and delivered in high resolution format for any digital and print use. A corporate brand is more than just your logo, although that is an important piece of the puzzle. A brand answers extremely important questions for your customers. What do you do, who do you do it for and why? Your personal stock library of photography will help you establish the look, feel and purpose of your company. We begin with interviewing the stakeholders and decision makers to identify key visual content to be used in multiple marketing channels. From here, we develop ideas for photographing the people, products and places that will become a curated set of images. We may present a Look Book, a shot list or a set of story arcs to flesh out during the photo shoot. Your goal is a curated set of “Original Content” images of your company and it’s work, your latest project or campaign or images spanning the life of a work in progress exemplifying your company identity. The scope of your project and amount of time to complete photography, schedule, usage and travel and will determine your Project Fee. Client Needs: Rich set of original brand photography artistically showing all aspects of this growing transportation safety company. 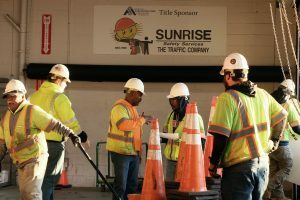 Our Strategy and Execution: During a discovery interview with the primary stakeholders of Sunrise Safety Services, we laid out a plan for several full day and half day photo shoots that would begin at sunrise, when employees gather equipment and head out for the day. Our plan included photographing each department during operations to create a number of candid and photographer directed images. Additionally we photographed all interiors, as well as, exterior transportation yards aerially using UAS/drone photography. In-the-field photography was created by riding with crews as they worked through the day. Night time photography and additional work scenes will continue to be photographed. Head Shots of all executive staff was created in their environment, interacting with employees and during a company Christmas event. 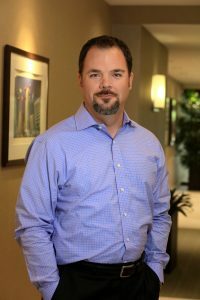 Client Needs: Chris McDonell wanted to answer the questions, who are we and what do we do at McDonell Consulting? 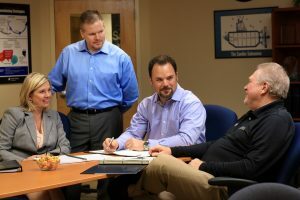 What do our surroundings look like, what would a customer experience at McDonell Consulting? Our Strategy and Execution: During a 2 hour photo shoot at corporate offices in Towson, Md., we created environmental head shots, also known as corporate head shots, in the lobby of their building. These images introduced the viewer to the upscale corporate environment of the building. Posed group portraits were created in an outdoor garden and interactive group portraits were taken in the McDonnell Consulting training classroom. McDonell Consulting owns visual content for use across a number of channels and touch points with their targeted market. Clients Needs: Harford Transit LINK, a Harford County government agency, was in the initial stages of development of a new website. 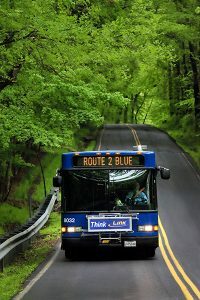 With an innovative mobile app called RouteShout and a responsive website design, Harford Transit LINK answers the questions “where is my bus?” and “what does the route look like” with visual and informative content. This project was conducted over several weeks and involved development of a shot list covering all the key routes and services provided by Harford Transit LINK throughout Harford and Cecil counties. Photography was created during hourly, half day and full day schedules, delivering a large number of images from which a “wide” edit culled a smaller number of images for extensive retouching. 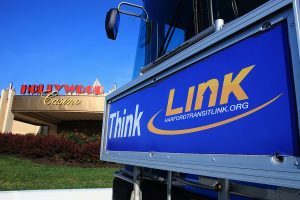 The Final image set populates Harford Transit LINK’s website, social media and print materials. Recently a set of key images was selected and printed as large custom images for corporate head quarters.